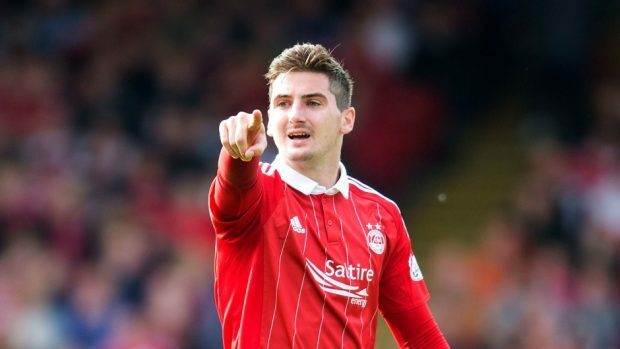 Kenny McLean will leave the Dons at the end of the campaign. Aberdeen missed out on the chance to secure second place after they were hit by a late double from St Johnstone at Pittodrie. Two goals in the final 10 minutes secured a fine win for Tommy Wright’s men against a disappointing Dons outfit. The Dons made one change from the side which beat Hibernian in the Scottish Cup semi-final last weekend with Niall McGinn restored to the starting line-up in place of Mark Reynolds, who dropped to the bench. Derek McInnes’ side faced a much-changed St Johnstone, who had been idle since losing to the Dons in the final game before the split earlier this month. Saints manager Tommy Wright made five changes to the team that lost 2-1 to the Dons in Perth with Tam Scobbie, Paul Paton, Michael Coulson and Blair Alston dropped to the bench while former Don Steven MacLean was suspended. Saints captain Steven Anderson, Chris Millar, Murray Davidson, Danny Swanson and Graham Cummins were the replacements. The Dons raced into a 2-0 half-time lead when the sides last met but there was no chance of that happening at Pittodrie in a dour first half. Adam Rooney saw a flick saved by Saints goalkeeper Alan Mannus while Kenny McLean directed a diving header wide for the Dons while Jonny Hayes used his pace to clear the danger after Danny Swanson had ran clear of the home defence. The Dons came out with renewed intent in the second half and McLean and Ash Taylor fired wide before Rooney saw his glancing header also fail to hit the target. But the home side would ultimately pay for not taking one of their chances as Saints scored twice in three minutes to claim victory. The opener came from a free kick, given after Joe Lewis had picked up the ball after it had been touched by Ryan Jack, and Saints midfielder Liam Craig touched it to Swanson who fired home. Aberdeen were stunned and Saints took advantage, hitting the Reds on the break to secure the win as Swanson passed the ball to Craig Thomson and the midfielder beat Lewis with a fine low drive.